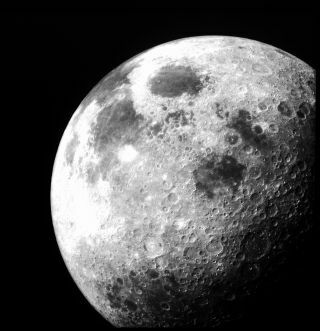 After Apollo 12 left lunar orbit this image of the moon was taken from the command module on Nov. 24, 1969. This story is part of a week-long SPACE.com series on what it would take for humanity to return to the moon to stay. Also coming on Friday on SPACE.com: Mining the moon. On July 21, 1969, Neil Armstrong became the first person to set foot on the moon, and in an instant, the world changed. Eleven other American astronauts would follow in Armstrong's footsteps over the course of NASA's Apollo program, which produced six moon landings in all. Yet in the 38 years since the sixth landing, humans have not ventured back to their closest cosmic neighbor. And perhaps we should not. As NASA embarks on a new plan for space exploration amid political uncertainty and budgetary constraints, some experts are hoping the space agency will look beyond the moon for the future of human spaceflight, and instead push deeper into our solar system than ever before. "We've done the moon – we understand it better than anything else," Buzz Aldrin, lunar module pilot on the Apollo 11 mission and second man to walk on the moon, told SPACE.com. "We've got to stop thinking of short-term hurrahs and start thinking of long-term investments." With China and India aggressively moving forward with robotic and manned missions to the moon, some analysts envision a rehash of the 1960s moon race between the United States and the Soviet Union. And while some camps are calling for a return to the moon to expand lunar science and potentially construct moon bases, others are less thrilled at that prospect. "As long as I've been involved in spaceflight, for about 20 years now, there has been this debate going on between the two groups," said Roger Launius, senior space history curator at the Smithsonian National Air and Space Museum in Washington. "I refer to them as the Martians and the Lunatics – the people who want to go to Mars, and the people who want to go back to the moon. No one side has the clear-cut answer. There are positives and negatives for both." Launius said returning to the moon could address important scientific questions, such as the existence of water ice, but with the objective of traveling to Mars on the horizon, he wonders whether it would cause NASA to be "sidetracked with years upon years of lunar exploration." "I'm less excited about a human mission back to the moon," Launius said. "I remember the first ones – they were cool. I'd love to see us go to Mars, but it's much more complex and difficult. And I really question whether we're going to be able to develop the expertise to take a task like that on." Others agree Mars is a more exciting destination and that a return to the moon should come eventually but should not top the space agency's list of priorities. "A return to the moon should not be NASA's primary goal or focus in this decade," said Robert Zubrin, president of the Mars Society. "Rather, the proper goal of NASA's human spaceflight program should be human missions to Mars. From a technological point of view, we are much closer today to being able to send humans to Mars than we were to sending men to the moon in 1961, and we were there eight years later." NASA's now-canceled Constellation program, established during the administration of President George W. Bush, aimed to return American astronauts to the moon by 2020. As part of the roughly $9 billion program, NASA was charged with developing new Ares rockets and a space capsule called Orion that would act as a replacement for the agency's retiring space shuttle fleet. But President Obama's 2011 budget request effectively shut down the moon-oriented Constellation program and shifted the focus of future U.S. space exploration toward asteroids and Mars. On Oct. 11, 2010, Obama signed a major NASA act that turned these lofty goals into law. The signing officially scrapped the Constellation program and set the stage for a manned mission to an asteroid by 2025, followed by a manned mission to Mars, currently envisioned for some time in the 2030s. The new space plan also opens the door for private spaceflight companies to create commercial vehicles to ferry astronauts into low-Earth orbit (LEO) while NASA sets its sights on targets deeper into the solar system. One such commercial firm is Space Exploration Technologies, commonly called SpaceX. The Hawthorne, Calif., company's Dragon capsule is designed to transport cargo, and eventually humans, aboard the company's Falcon 9 rocket to the International Space Station. "I think Mars, given that it holds the potential for making life multi-planetary, is much more important than the moon, and that should be the focus of future manned exploration," said Elon Musk, the chief executive of SpaceX. "However, if there turns out to be a market for traveling to the moon, SpaceX will support that just as we support LEO activity." In addition to his concern that sending more Americans to the moon would tie up resources that could be used to develop Mars-bound technology, Aldrin said engaging in another moon race would jeopardize the legacy of U.S. dominance in space exploration. "Manned missions to the moon should carefully consider U.S. leadership in space as we expand human presence outward into the solar system," Aldrin said. "If we go back to the moon and get there second or third, that is not U.S. leadership. Activities going back to the moon should be led by the U.S. – but not at the expense of leading the world in space and expansion outward." Arguments for human exploration of the Red Planet are no less politically charged. "Given courageous leadership, we could be on Mars by 2020. That should be our goal," Zubrin said. "To say we cannot do it is to say we have become less than the kind of people we used to be, and that is something this country cannot accept and cannot afford."